I read this article and found it very interesting, thought it might be something for you. The article is called Why 75% Drop in Global Oil Prices Isn’t Reaching You and is located at https://archive.indiaspend.com/cover-story/why-75-drop-in-global-oil-prices-isnt-reaching-you-93707. 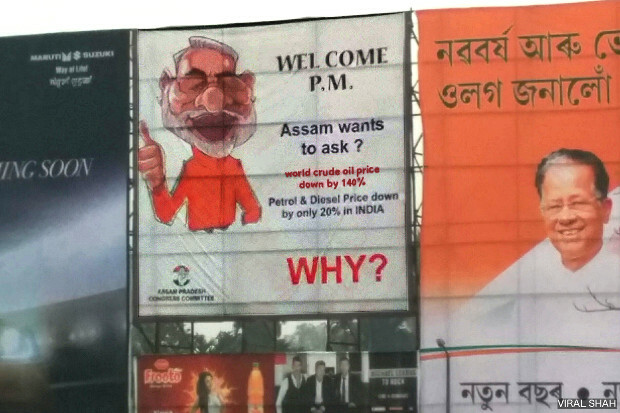 A hoarding in a busy square in Guwahati, Assam, where assembly elections are due by June. Record production in the United States (US), weakened demand from the Eurozone and emerging economies like China and Brazil, and Iran’s entry into the international market have effectively slashed the price of crude oil for India, from $106 per barrel in July 2014 to $26 in January 2016—a 75% drop over 15 months. So, why are you not seeing evidence of this price-cut at your local petrol and diesel station? The answer: As global crude prices reach a 11-year low, the Centre and state governments steadily increase excise duties and value-added tax, shoring up their revenues and keeping fuel prices high for retail consumers. Retail prices of petrol and diesel prices in three states—Assam, Uttar Pradesh and Gujarat—show a variation of less than 10% during the current financial year, 2015-16, according to an IndiaSpend analysis. For instance, the petrol price in UP rose Rs 2 per litre, when global oil price halved over the same period. Indian prices stay high because oil marketing companies (OMCs), such as Indian Oil Corporation Ltd, Hindustan Petroleum Corporation Ltd and Reliance Industries Ltd., add their margins, the central government adds excise, state governments add their own (value-added) taxes, and the dealers (petrol pumps) get their commission. The total of these is the retail price of the fuel you pay. The excise duty on petrol and diesel has been hiked five times over the last three months, increasing the excise duty on petrol by 34%. On diesel, excise duty has increased by 140%. The price at which OMCs sell petrol to dealers (petrol pumps) has been halved in two years. Over the same period, retail petrol prices have come down only by 15%. The value-added taxes imposed by states have more or less remained the same, but excise duties—both basic and additional—imposed by the Centre have doubled between 2014 and 2016. The addition of central taxes on diesel is higher than those on petrol. Central taxes per litre of diesel rose to four times its value in April 2014—from Rs 4.52 per litre to Rs 17.33 per litre in February 2016. Retail consumers pay more tax on petrol and diesel than its actual price. Of the price you pay for a litre of petrol, 57% goes to the government as tax. Of the Rs 44 per litre of diesel, 55% is tax. If the excise duties on diesel had not been increased these two years, diesel would have cost Rs 32 per litre today, other factors remaining the same. The direct effect of oil prices on cost of transportation of goods and thus consumer inflation has been demonstrated by research from Integrated Research and Action for Development (an autonomous research institute), as journalist and economist Swaminathan Anklesaria Aiyar wrote in this blog. Research on inflation in Turkey and Sri Lanka has underlined the effect of fuel prices on inflation. The Modi government has had a great foresight to collect taxes at a precarious time, when our GDP growth is not 11.5% but is around 7.5%. After two continuous drought years, “jumla-man” still squeezes farmers in the form of taxes (diesel). He knows the art of “Pathhar se tel nikalna”. The quote of Mr Swaminathan’s research and blog is not correctly representative here. He has mentioned that diesel shouldn’t be subsidised and also said 30% increase in prices will have better impact in society by improvement in resources allocation. Another thing wrongly mentioned in your article is the over exaggerated impact of cost on goods and transportation which is very minimal. However, impact on cost reduction by reducing prices of diesel or petrol is almost nil as no public transporter will reduce their trip cost.